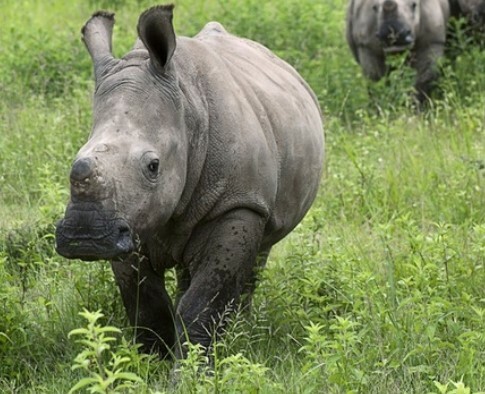 Baby Rhino Robyn at Baby Rhino Rescue | Adopt and Donate Now! Robyn came to Care for Wild Africa from the Tshakwane area of the Kruger National Park in July 2014. Her mother was poached. Robyn is a feisty, strong, young rhino. She was in a state of extreme anxiety when she arrived and so she was unpredictable and difficult to access. She took time trusting her new situation. She was reluctant to come out her night pen, wanting to stay in a safe and dark place when the other rhinos went out into the sunshine and it took some enticing to get her out into the open. At first she had to be fed "around the corner," out of sight of the others. Slowly she began to trust the volunteers and realize that she was in a safe and good place. She has settled down beautifully now and continues to be full of energy and naughtiness. If things are too peaceful, Robyn feels she has a duty to stir things up. Tank used to be the biggest of the rhinos in their group, but Robyn has outgrown Tank and she is the big girl in the boma, which makes her very easy to identify. She didn’t have a special friend until Skylar arrived. Now she and Skylar are inseparable. Skylar is younger and smaller and Robyn looks after her like a little, special sister. If Skylar lies sleeping with her foot in Robyn’s face, Robyn doesn’t mind. She allows Skylar to do just about anything. It might have taken time, but Robyn has found real friendship and happiness in her new home.